Why restrict yourself to one stock or a set of stocks that are handpicked? What if you could invest in a fund that is a perfect replica of the Index? The NIFTY 50 is an index of the NSE, which is a barometer by which the Indian economy can be measured. The Quantum Nifty ETF (QNF) is a replica of the NIFTY 50; the stocks that form a part of NIFTY 50 also form a part of QNF`s portfolio in the same proportion and weightage as that of the NIFTY 50. 1. Passively replicates the portfolio and performance of Nifty 50 index. 2. Lets you to own the shares in the Index for a fraction of their value in the Index. 3. One of the lowest Expense Ratio in the category. 4. Makes it possible to clock returns in line with the benchmark index meaning investors are in tune with the broad market at all times. 5. Allows you to diversify across the top companies in different sectors through a single investment. Note: Please note the expense ratio for Quantum Nifty ETF is 0.08% excluding statutory levies and taxes.w.e.f February 28, 2018. Solution For: Your need to invest in all companies of Nifty 50 in one fund. A passive fund that mirrors the index. Mr. Hitendra Parekh is the Fund Manager effective from July 10, 2008.
Dividend of Rs. 80 was declared on 9 March 2018. Scheme return calculated above is inclusive of dividend amount. What is Quantum Nifty ETF or QNF? Quantum Nifty ETF is an Exchange Traded Fund also known as ETF. An Index ETF is fund that has any stock exchange index as the underlying security. So, the value of the ETF is derived from the value of underlying index. Index ETF would be a passive investment; so, when index prices move up, the ETF appreciates and when index prices move down, the ETF price comes down. As Index ETFs track Index prices, the only differentiating factor would be the costs borne by the Fund House. Quantum Nifty ETF – QNF seeks to offer investors a cost-efficient way to invest in Nifty 50 Index. It is an open ended scheme replicating / tracking Nifty 50 Index. The units of QNF issued under the scheme will be approximately equal to the price of 1/10 (one-tenth) of the Nifty 50 Index. Through the lower cost of operations, QNF would provide investors an excellent means of investing in Nifty 50 Index which is a broad based diversified index. • QNF offers diversification as it comprises of a basket of securities, which inherently provides diversification across an entire index. • QNF gives you a better idea beforehand about where your money will be invested. The performance of QNF generally corresponds to the underlying Index. • As a retail investor, you might not be able to afford the entire basket of underlying stocks. QNF offers affordability as the unit cost is low when compared to the prices of its constituents. E.g. Assume that ABC Industries forms approximately 10% of the CNX NIFTY Index. To buy one unit (share) of the same the investor has to pay approximately Rs. 800.00 (the current price of ABC Industries on Stock exchange). But by investing Rs. 500.00 in QNF (which consists of ABC Industries approximately 10%) the investor is buying Rs.50.00 worth of ABC Industries share (1/10th of Rs.500.00) and also getting exposure to 90% of other CNX NIFTY stocks. What is the Investment Objective of the Quantum Nifty ETF? The investment objective of the scheme is to invest in stocks of companies comprising Nifty 50 Index and endeavor to achieve returns equivalent to the Nifty by “passive” investment. The scheme will be managed by replicating the Index in the same weightage as in the Nifty 50 Index with the intention of minimizing the performance differences between the scheme and the CNX Nifty Index in capital terms, subject to market liquidity, costs of trading, management expenses and other factors which may cause tracking error. What are the different features available under the Quantum Nifty ETF? Systematic Investment Plan, Systematic Transfer Plan and Systematic Withdrawal Plan are not available under Quantum Nifty ETF. Investors do have the option of regularly buying units from the listed exchanges and accumulating their QNF holdings. Where will the Quantum Nifty ETF invest? What is the Current portfolio? The AMC uses a "passive" or indexing approach to try and achieve Schemes Investment objective. The scheme would alter the scrips /weights as and when the same are altered in the Nifty 50 Index. Click here to view the current portfolio of the Quantum Nifty ETF. What is the Benchmark of the Quantum Nifty ETF & Why? The performance of the Quantum Nifty ETF will be benchmarked to the performance of Nifty 50 - Total Return Index. The scheme will track Nifty 50 - Total Return Index and portfolio of the scheme comprises by replicating the Index in the same weightage as in the Nifty subject to tracking error. Thus, the aforesaid benchmark is such that it is most suited for comparing performance of the scheme. Who is managing the Quantum Nifty ETF? Mr. Hitendra Parekh is managing the scheme. Directly with the Fund: The investors can create / redeem in exchange of Portfolio Deposit and Cash Component in creation of minimum unit size of 2000 units at NAV based Price. • Quantum Nifty ETF is listed on the National Stock Exchange (NSE) with the symbol QNIFTY. You can buy/sell Quantum Nifty ETF units on the National Stock Exchange. • You can buy QNIFTY units on the capital market segment of NSE through your stock broker or through your online trading service during trading hours at a price which may be close to the NAV of the Scheme. • Minimum lot size is one unit. Quantum Nifty ETF is listed on the National Stock Exchange (NSE) with the symbol QNIFTY. You can buy/sell Quantum Nifty ETF units on the National Stock Exchange, through your stock broker, or through your online trading service. Each unit of QNF will be approximately equal to 1/10th (one tenth) of the Nifty 50. The investment process will change according the category you fall under i.e. Retail Investor and Large Investor or Authorised Participants (AP). • Units of the QNF will be issued and settled compulsorily in dematerialized form. So you should have a Demat (beneficiary) account with a depositary participant of NSDL or CDSL. • You can buy QNF units on the capital market segment of NSE, during trading hours at a price which may be close to the NAV of the Scheme. • You have to instruct your broker to buy/sell QNF units and pay the transaction amount to him. • After the execution of trade; the broker will transfer the QNF units directly to your Demat account. • If you trade online, you can input buy/sell orders on your system at your convenience and pay the broker online. QNF can be found under the equity section, and not mutual fund section, of your online trading service. Who can and cannot invest in the Quantum Nifty ETF? What is the current expense ratio of the Quantum Nifty ETF? Current expense ratio is 0.094% p.a. with effect from February 28, 2018. (0.08% excluding statutory levies and taxes). Effective 01 Dec 2018, the base TER has undergone a change, however the Total Expense Ratio remains the same. What are the entry and exit loads for the Quantum Nifty ETF? Can I hold the units of the Quantum Nifty ETF in Demat mode? The units will be issued only in dematerialized form through depositories. 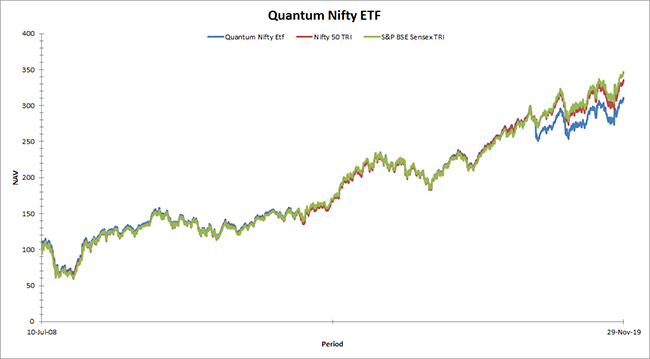 How has the Quantum Nifty ETF performed? To check the performance of the Quantum Nifty ETF Fund you will have to go through the current factsheets. Tell me more about the NAV applicability and cut-off timing of the Quantum Nifty ETF. Tell me about the Tax implications if I invest in the Quantum Nifty ETF.